Kate brings the best of Tonga to this comprehensive guidebook, with years of experience living in the Friendly Islands as a volunteer. She'll take you through cultural norms such as the eyebrow flick and greeting sniff, explain the curious clothing fashions, help you find unexplored attractions, and recommend world class diving/snorkelling where new reef systems and wreck dives are continuously being uncovered. After reading this guidebook you'll be ready to discover the hidden gem that is Tonga. Inside Lonely Planet Rarotonga, Samoa & Tonga Travel Guide: Colour maps and images throughout. Highlights and itineraries help you tailor your trip to your personal needs and interests. Honest reviews for all budgets - eating, sleeping, sight-seeing, going out, and shopping. Cultural insights give you a richer, more rewarding travel experience –history, etiquette, lifestyle, sport, arts, architecture, literature, music, dance, craft, tattooing, environment, geography, ecology, religion, myths & legends, cuisine, politics. Over 30 colour maps. Covers: Raratonga, Aitutaki, ‘Atiu, Mangaia, Samoa, American Samoa, Tonga, Nuku’alofa, Ha’apai Group, Vava’u Group and Ma’uke. Get lost among the thousands of beautiful islands in the earth's largest ocean. Lap it up in Tahiti, go native in Vanuatu or ponder the mysteries of Easter Island; the possibilities are as vast as the Pacific itself. With 10 authors hitting the islands everywhere from the Solomons to Pitcairn and Easter Island, Lonely Planet's South Pacific is very comprehensive. Get the real story on tropical beaches, island resorts, blue lagoons and friendly Pacific cultures. This guide covers: Easter Island, Fiji, New Caledonia, Niue, Pitcairn Island, Rarotonga & Cook Islands, Samoa, American Samoa, Solomon Islands, Tahiti & French Polynesia, Tokelau, Tonga, Tuvalu, Vanuatu, Wallis & Futuna. Detailed maps and full-colour images. Reviews of recommended resorts. Diving chapter takes you beneath the Pacific waves. Leuchtend weiße Bilderbuchstrände, sich im Wind wiegende Kokospalmen, türkisfarbene Lagunen und winzige Atolle inmitten der Unendlichkeit des Pazifischen Ozeans - die Inselparadiese der Südsee üben seit den Tagen der ersten europäischen Entdecker eine ungebrochene Faszination aus. Hinzu kommen die außerordentliche Herzlichkeit und Gastfreundschaft, für die die Menschen im Südpazifik seit jeher bekannt sind sowie ihre kulturelle Vielfalt, die Besucher auch heute noch begeistert. Das DUMONT Reisehandbuch Richtig Reisen "Südsee" ist der ideale Begleiter, um diese Inselwelt kennenzulernen. Es präsentiert die besten Touren, gibt eine Fülle von Tipps für Aktivitäten und besondere Erlebnisse und fasst wichtige Hintergrundinformationen zu geschichtlichen, aber auch zu aktuellen politischen, wirtschaftlichen und gesellschaftlichen Themen kompakt zusammen. Tonga is the Pacific's only kingdom and is situated between Fiji and Samoa, north-east of New Zealand. The Friendly Islands archipelago consists of five island groups and 171 islands, most of which are uninhabited. The 100,000 people live mostly on Tongatapu Island. The map contains detailed maps of each major island and includes tourist information and hotels. 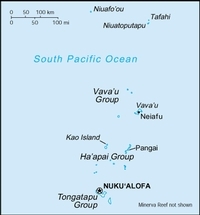 An inset of the capital, Nuku Alofa, is included; printed on paper, single-sided.